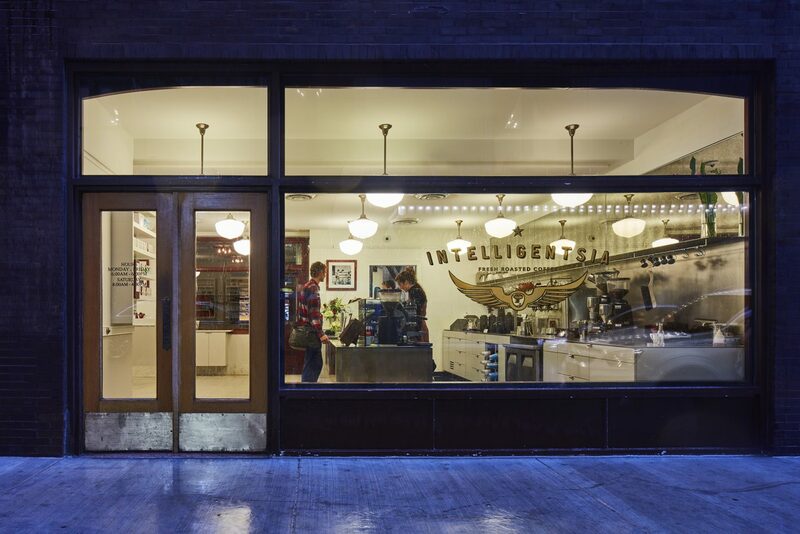 Nestled in the historic Monadnock building, Intelligentsia renovated its classic storefront coffee bar to improve client experience, efficiency and merchandise display. A new compact service bar with integrated pastry and cold case helps improve functionality and relieves a formerly awkward side entrance behind a movable pastry cart. The new bar footprints were limited to the footprints of the old bars to maintain the existing marble floor. 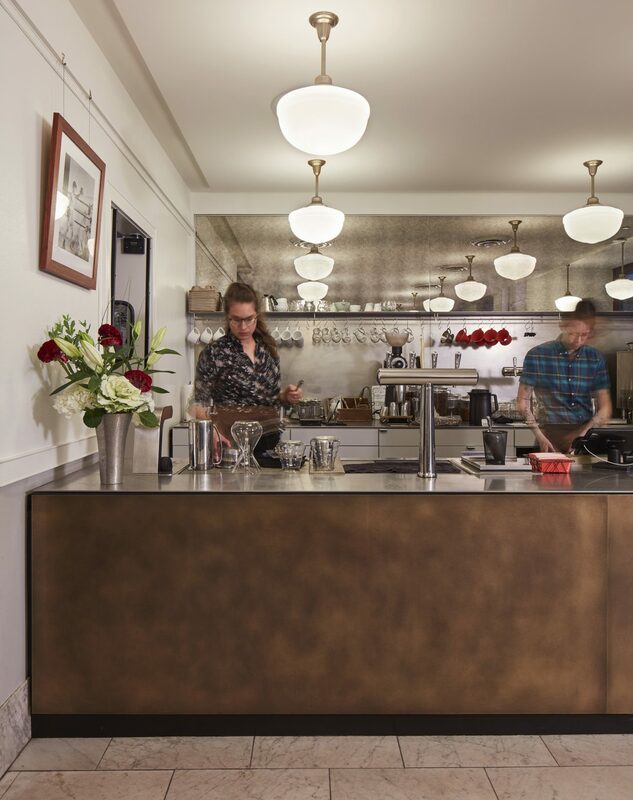 The front bar top is designed at 34” high to achieve customer accessibility across, and not just at the point of sale, which also invites a more intimate barista-customer interaction. Inspired by materials found in the historic building, new contemporary surfaces and detailing update and refresh the space while remaining sensitive to the existing white marble and dark stained window frames. 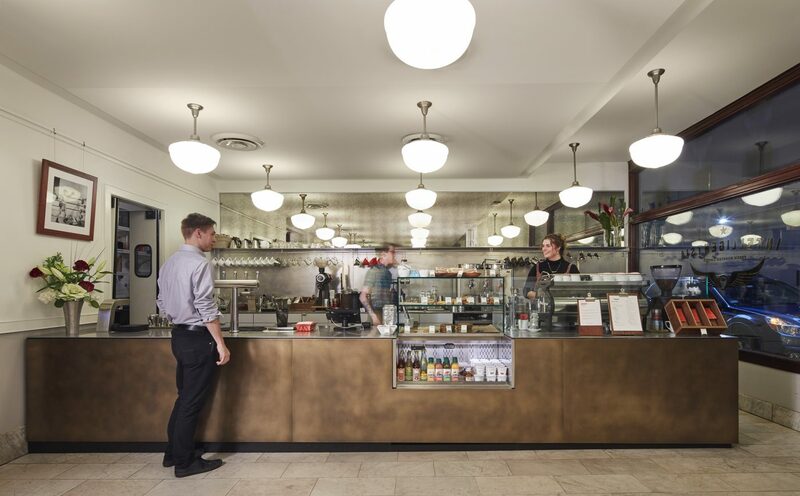 Clad in bronze to complement existing café hardware, the service bar is held off the floor and away from the wall, expressed as a free-standing contemporary intervention that lets the traditional walls remain as they are. New high-performing stainless-steel countertops are designed with flush drain trays and microgrills for an improved, entirely integrated working surface. 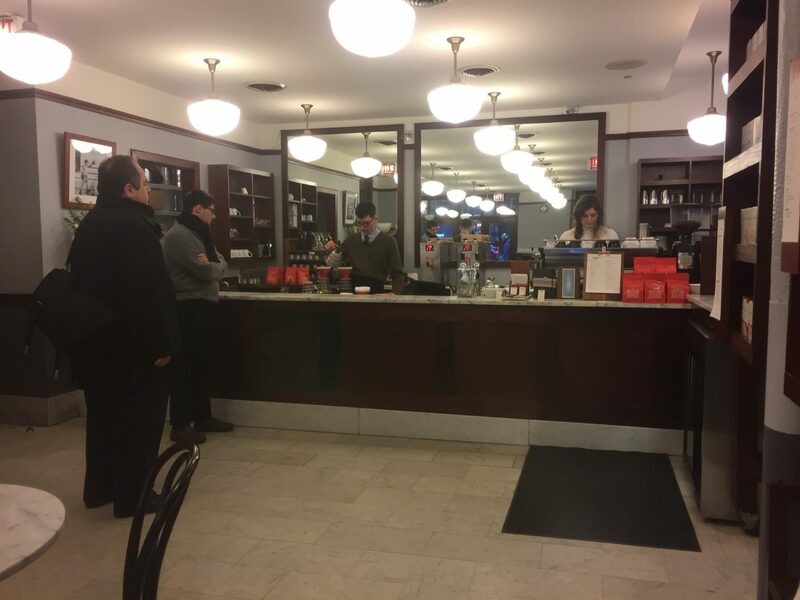 A completely clear glass pastry case floats above the bar, and extends to become a sneeze guard for the espresso area. Behind the bar, a brushed stainless backsplash and a frameless textured mirror help brighten and add visual depth to the space. The stainless steel and mirrored back wall recall the materials in the lobby of the Monadnock that enclose the elevator shafts. 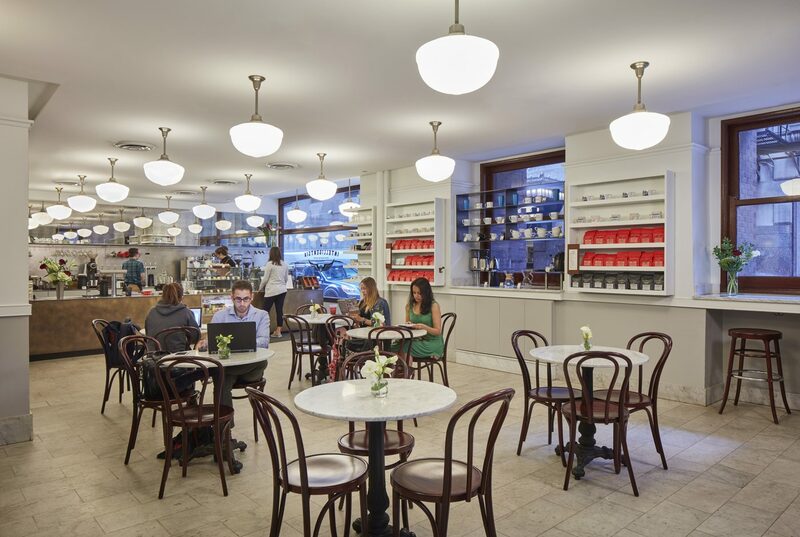 In the seating area, formerly sabotaged by ambient noise, a stretched fabric ceiling provides a seamless acoustical solution to improve client experience and visually disappears behind the existing pendant fixtures. An added open shelf spans across a window to display merchandise at eye level and replaces a formerly disorganized and inaccessible lower cabinet. 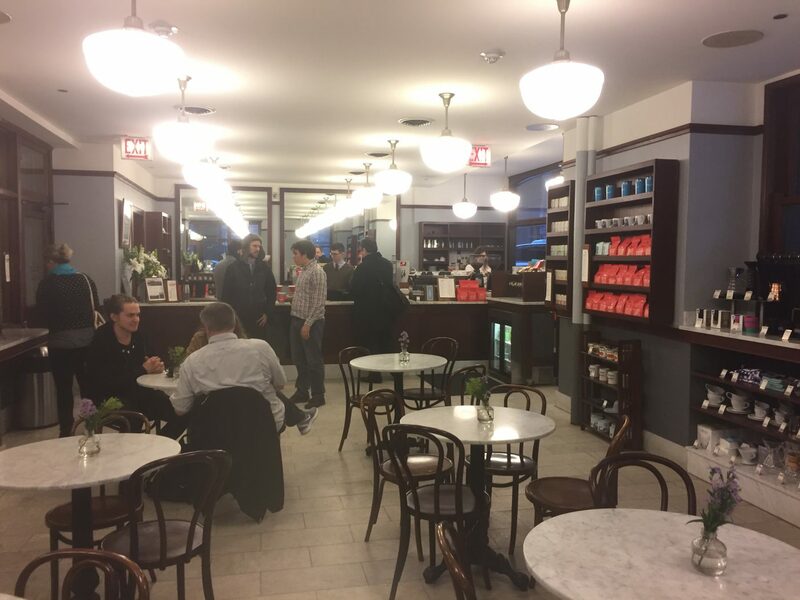 "Renovation & Rebirth at Intelligentsia's Historic Monadnock Cafe"